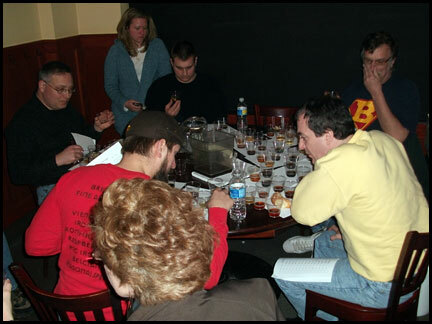 The War of the Worts (WOTW) XV homebrew competition was yesterday, Saturday 02.20.10, and it was good times indeed. With 816 entries in this years WOTW competition this was big! You can check out all the results here – RESULTS. It had been quite a while since I judged at a competition, maybe 6-8 months, but I was hyped to get into it. 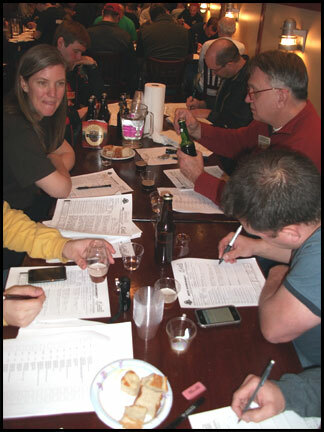 In the morning I was able to judge the Specialty Beer category with 44 entries and 8 judges, so about 11 entries per pair. The Specialty Beer category is kind of the catch-all for beers that don’t fall into other categories: experimental techniques, historical, style-bending, and total odd-balls. I actually really enjoy judging this category, there are a lot of mediocre beers that wind up here, but there are some that are kind of inspirational that help you formulate your own ideas. I believe the top three that moved on were an American Wild Ale (spontaneously fermented in the LeHigh Valley, haha), a Gruit (beer made without hops but with herbs to supply the bitterness), and an Imperial Pilsner. We probably started around 9:00 and wrapped the first round at a little after 12:00, not too bad. Iron Hill Brewery then generously supplied us with lunch, two different tossed salads and a combo of sicilian-style pizza and wood-oven pizza. I think the IH crew wasn’t anticipating how much judges like to eat free food, they were having a hard time staying on top of our consumption of mass quantities, but it was all good an no one didn’t have enough to eat. After lunch I was able to judge Wood-Aged and Smoked Beers. Sounds like an interesting category, but I’ll tell you what, it is a palate destroyer, I’m not sure I’d want to judge that one again. This time there were 33 entries I think with 8 judges again, so it should have been about 8 beers per pair, my partner and I judge very similarly and we were able to do 13 beers in the afternoon. The best beer we had was a great IPA aged on cedar. I really wish I knew more of what the cedar was suppose to contribute because I’m afraid it didn’t fair as well as it could have if we had a descriptor to reference to see what cedar contributions were suppose to be like. It tasted like an awesome hoppy shortbread cookie or something, I really dug it. I think the top three were an Oaked Old Ale, a Smoked Porter, and a Smoked something-something. The Smoked Porter was bacon-esque while the Smoked something-something was more camp fire-esque, interesting. Judge 1: Almost flat, sticky resiny pungent hops with some caramel and alcohol, tasted like it really would have “popped” if not for lack of carbonation. Judge 2: Low carbonation, very hoppy – nice balance of citrusy, piney, and grapefruit, good example of an Am IPA on the edge of a IIPA. Judge 1: Good Imperial IPA, citrus and pine, almost grape like aroma, plum and stone-fruit in flavor, very good attempt at style. Judge 2: May be too estery for style, hop flavor is definitely present, other flavors include watermelon, grape, and lemon from hops and esters. So there you go, unbiased “professional” opinions of my beer. I really don’t like arguing with what the judges say because, well, I want to respect their opinions as much as I want mine respected, but I also know how the process works and sometimes a good beer can get brushed to the side just because the judge is trying to judge it <- I don’t even know if that made sense, haha. Looks like there were 41 AIPAs in the competition and 25 English/and Imperial IPAs. I think the one thing that bothers me most is the carbonation comments from the AIPA judges. I know the beer was well carbonated, I actually just had a bottle from the same batch the other day, so it makes me think they received a “bad bottle” for some reason, like perhaps the cap wasn’t set correctly when I bottled it and then through time and shipping the carbonation level dropped, dunno, but it tweaks me a little bit. Really would have liked to place, especially in such a big competition, but alas I didn’t, oh well. Good feedback is always good on it’s own. This entry was posted on Sunday, February 21st, 2010 at 11:09 am	and is filed under Homebrew. You can follow any responses to this entry through the RSS 2.0 feed. You can leave a response, or trackback from your own site.